GESCO is committed to transforming lives through innovative medical solutions that improve global health. We design and manufacture high-quality neuro, orthopaedic and spinal implants along with a vast array of surgical instruments through active collaboration with the medical fraternity. Established in 1962, we are the largest spinal implants manufacturer in the country today. With a continual emphasis on innovative enhancement of our products and processes, our Innovation Centre develops path-breaking and cost-effective organic technology to alleviate the pain of patients across the globe. Our pursuit of excellence has been sustained by a team of passionate engineers and technicians, cutting-edge technology, world-class infrastructure and our focus on quality. International medical and standard certifications like Indian FDA, ISO 13485, CE marking, US FDA, WHO-GMP stand as a testament to the quality of our products. In a span of 50+ years of manufacturing and exporting implants and surgical instruments, we have gained the trust of clients across India, Asia, Africa, Europe, North America and South America. We are transforming the way the world views healthcare. We want people to lead healthier, happier lives and gear all our actions towards this single purpose. 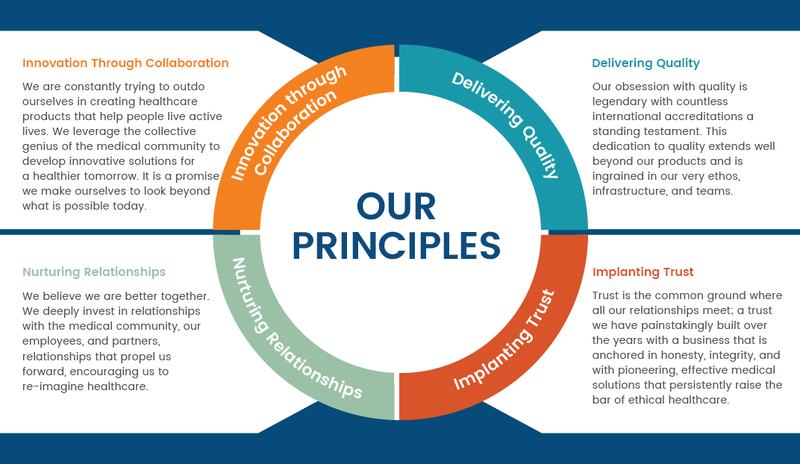 Invested in the future, we engage with all the stakeholders to innovate, develop, and deliver affordable and accessible healthcare products, revolutionising medical standards across the globe. To become one of the top healthcare brands globally.